…On the fifth day of Christmas my green friend gave to me…five pairs of slippers…four chocolate bars…three holly trees…two vent fans…and a new doorbell! Five pairs of slippers? Is my green friend crazy? Actually my green friend is very thoughtful! After battling sand spurs in both front and back yards for a couple years my dog no longer wanted to go outside because of inevitable sand spurs in his paws. I decided to inaugurate a “no-shoes” policy in the house. I was finding (actually Koji was finding) sand spurs in the house that tradespeople and guests tracked in! I have always removed my shoes in my house for sanitary reasons but now I decided to make this my request/rule for visitors and tradespeople as well. I know some people might think this is crazy but when you think about all the consequences of wearing your “outside” shoes inside your house you might look at it differently. We all know there are many types of treads on shoes some of which collect more outside stuff than others. What’s in that “stuff”? Of course the first thing you might think about is dirt…mud, loose dirt, grass clippings, etc. Not a big deal…just vacuum, right? Wrong! You never know where tradespeople or your guests have walked before entering your home. Did they walk through a yard where pesticides or herbicides had just been applied? Maybe they walked in a house where harsh chemicals were used to clean floors? Or maybe they just walked through a patch of sand? OK, just plain dirt…not a big deal? Of course that means wear and tear, more cleaning, more cleaning products and depending on your floor type and finish this could need more sealants or more frequent “repolishing/restoring” of your floors. I know I just invested a goodly sum of money to have my terrazzo floors restored (they were covered by carpet) and I want the finish to last as long as possible. Since I live in Florida I know that sand is quite an abrasive and don’t want to prematurely age my floors. Pesticides and toxins: the EPA has conducted several studies and researchers found that the herbicide 2,4-D could be easily imported inside via shoes for up to a week after application. And not only that, but the “track-in” exposures of these chemicals may exceed those from residues on non-organic fresh fruits and vegetables. The study didn’t expound on the health threat of the specific herbicide, however the study’s lead author, Dr. Robert G. Lewis, said the potential exists. Exposure to 2,4-D can cause immediate and relatively minor problems like skin rashes and gastrointestinal upsets; long-term health effects of the herbicide are unknown, the EPA said. So what about bacteria? Your shoes pick up sneaky bacteria which are then spread about your home when you wear shoes inside. A study from the University of Arizona collected germs and microbes on footwear. The researchers found 421,000 units of bacteria on the outside of the shoe, including E. coli, meningitis and diarrheal disease; Klebsiella pneumonia, a common source for wound and bloodstream infections as well as pneumonia; and Serratia ficaria, a rare cause of infections in the respiratory tract and wounds. In another study done by the University of Arizona 9 different forms of bacteria were found on the bottom of shoes. Good Morning America did a test and found that the bottom of shoes were dirtier than toilet seats also. Furthermore, Dr. Charles Gerba, a microbiologist and professor at the University of Arizona did a test with a brand new pair of shoes and found that within just two weeks of wearing a new shoe 440,000 units of bacteria were found on the shoe. An astonishing 27% of that total bacteria were deadly E Coli. Klebsiella pneumonia was also found, which can lead to and cause pneumonia and wound and bloodstream infections and another type of infection called Serratia ficaria, which can lead to infection of the respiratory tract. Maybe less important to many….if you live in a multi-family dwelling, the “clop-clop” of your shoes might be heard by your neighbors. Barefoot or slippers will make you a better neighbor! All these reasons lead me to believe my no-shoes policy is the best for my home! So what about when you visit friends? When I arrive at someone’s home I typically remove my shoes at the front door regardless of what the host/hostess is wearing. At other homes I have seen signs like”This Redneck Queen requests the removal of your shoes before entering” or the host/hostess’ requests removal of shoes before entering. 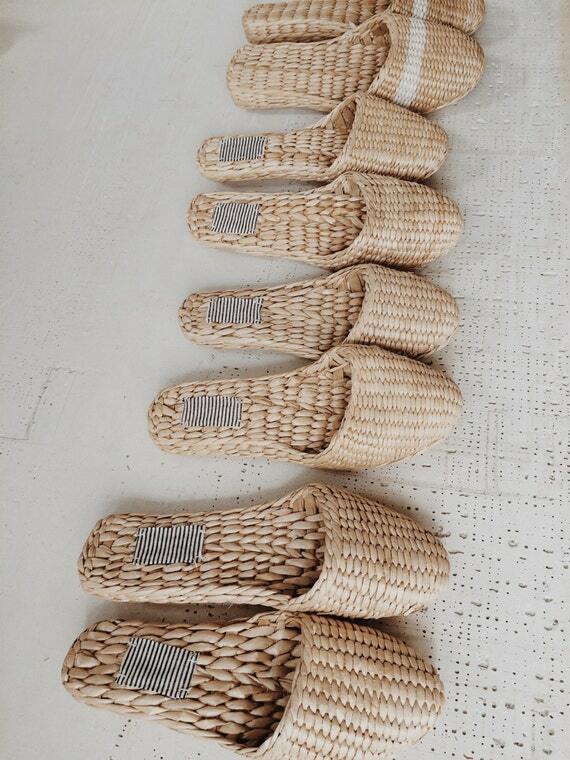 I am so grateful to my green friend for giving me five pairs of straw slippers so I can leave these by my front door after I ask visitors remove their shoes! I am working to achieve a healthier indoor air quality and my dog is much happier when visitors remove their shoes! Do you and your family wear shoes in the house? If this is the first post you have read of my green rendition of the Twelve Days of a Christmas and you can’t figure out what the heck I am writing about or why I’m writing about the Twelve Days after Christmas, click here to read how this all began. Please join me tomorrow for the Sixth Day of a Green Christmas!